This one is a new antenna to me.. I see these popping up a lot around my area. I have never seen these before and wondering what they are and if they are any good. I did stop and talk to one guy that had one and he said it worked great. Personally I dont think he knows all the stations he can get, so I am not sure how great it really works. HDTVPRIMER is an independent HAM / engineer with quite a bit of information re. among other things, TV antennas. A bit pricey, but a good medium gain UHF antenna. The H-VHF performance is going to be limited at best, so in the Phoenix area one may miss out on several stations. Other similar antennas would be Antennacraft U4000, Antennas Direct DB-4, Channel Master CM-4221 and Winegard HD4400. Last edited by GroundUrMast; 28-Apr-2011 at 1:05 AM. It is a UHF antenna. Here are Tv channels. UHF 14 thru 69 , VHF High 7 thru 13 , VHF Low 2 thru 6 . Most people buy antennas on the way it looks and not on the channels it is designed to receive. Here is a list of Tv channels and frequencies , there are wide gaps of frequencies between the different blocks of channels and this is the reason that Tv antennas that receive All the channels look the way they do. 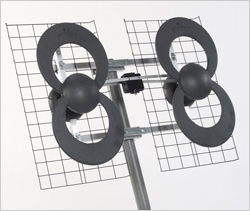 Here are examples of different types of antennas , http://www.kyes.com/antenna/pointing/pointing.html . . . . . . http://www.hdtvprimer.com/ANTENNAS/TVfrequencies.html . . I wonder what is more important , looks or channels ?? Last edited by John Candle; 28-Apr-2011 at 5:41 PM. The C-4 is designed for reception of UHF channels 14-69. You have VHF channels 8 KAET, 10 KSAZ, 12 KPNX, and 13 KOLD in Phoenix and Tuscon. In your case the VHF signals are too weak to work properly unless you have a real VHF antenna. Consider the HD7696P that's rated for channels 7-69 and use an AP-8700 preamp. Because of the pair of double loops the C-4 looks to me like it ought to have an 88 in it's model number.